In a jaw-dropping move, the Marines have cracked down on none other than wearing uniform (from the Strategy Page). The U.S. Marine Corps has decided that it is not good for the image of the Marine Corps for marines to wear their combat (“utility”) uniform off base. New regulations nullify many exceptions to this rule that had been established by the commanders of many marine bases. The new rule allows marines to wear their cammies (camouflage) uniform while driving form (sic) their off-base home to and from work. In the next revelation, we sit in wonder at the DoD actually paying people to spend time crafting the caveats, stipulations and qualifications. Hold onto your cover. But they may not get out of their vehicle while wearing cammies unless it is an emergency (an accident, or some matter of life-and-death importance.) Marines may not get out of their car to gas up their vehicle while wearing cammies. If they run out of gas, they may then exit their car to deal with that. Marines are advised to pay attention to the fuel status of their private vehicles, and to carry a set of civilian clothes, or a marine service uniform, in their vehicle, in case they have to get out. The only exception is for marines driving military vehicles for long distances. Marines may exit their vehicles to use the toilet, but this must be done as quickly as possible. On the bright side, tax advisors believe this new rule will allow marines to deduct the cost of their work uniforms from their taxes. In the past, the IRS had ruled that the cost of utilities, fatigues and BDUs were not deductible as they could be worn off base. The IRS reasoned that, if you could go into a store or restaurant, your uniform was not limited to the workplace, and was therefore not deductible. 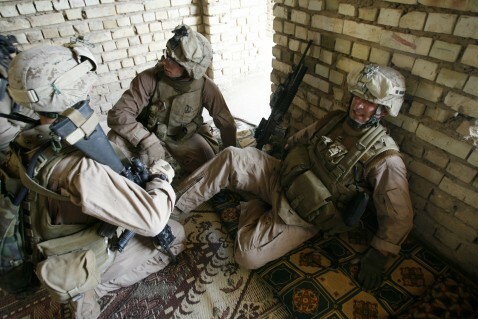 The high tech camies worn today are not cheap, and a marine can go through several hundred dollars worth a year. Again, this is absolutely jaw-dropping. Here we have the Marine Corps weighing in on how quickly a Marine can use the bathroom during travel, and stipulating that if it isn’t fast enough, he will have to strip down inside the automobile to change into his service alphas (but only if he is traveling long distances and assuming he has either placed a pair in his car or has purchased an additional pair for his automobile). The pittance that is saved on taxes each year will be outweighed by the additional purchase of clothing, placing additional civilian clothing at work, and the aggravation of considering these rules and trying to adhere to them. At a time when the Marine Corps is trying to increase its size and retain experienced personnel, it is things like this that will cause them to bolt for the civilian world. Finally, the Marine Corps has just handed the Army a recruiting victory on a platter. Now when the little boy in the airport, at the gas station or simply out at the mall or in the city asks mom, “who is that?” she can answer, “Son, that is a brave Soldier.” The U.S. Marine Corps now forces all of its warriors to go through the public square incognito. Sometimes one can only shake his head and move on to other things. There is no explanation. I think we should have an investigation. The PAOs and lawyers could lead it. Perhaps we should transfer Beauchamp. Yes I suppose that’s right. I suppose that’s the thing to do. Wait. Wait. I’ve got a better idea. Let’s transfer the whole squad off the base. Let’s — on second thought, the whole division … let’s transfer ’em off the base. Go on out there and get those boys down off the fence, they’re packing their bags. Get me the President on the phone; tell him we’re surrendering our position in Baghdad. Wait a minute. We won’t call the President just yet. Perhaps we ought to consider this a second. Maybe we have a responsibility to this country to see that the men and women charged with its security are trained professionals. Yes. I’m certain I once read that somewhere. And now I’m thinking that our idea of investigations and hand wringing and surrender, while expeditious, and certainly painless, might not be in a manner of speaking, the American way. Young Private Beauchamp has had a lot of extra time on his hands. He has had time to send e-mail, make telephone calls, and perhaps even eat ice cream. After all, they have a dining hall, a place to actually sit and eat chow. After considering surrender, I have changed my mind and I advocate training young Beauchamp. Yes, that’s it! There are Marines in Combat Outposts in Fallujah who have no chance to eat ice cream in dining halls. They take showers by using baby wipes, and they have to burn their human waste in pits of stinking fire. They have no electrical power, and no amenities. They certainly don’t write e-mails home to use as articles for or against anything. They are busy 20 hours out of the day, and sometimes 24 hours out of the day. Young Beauchamp needs to be trained. He badly needs to stay busy. Young Beauchamp needs to be on patrol, picking up a rifle and standing a post, and contributing to Operation Iraqi Freedom. Let’s send him out to the Combat Outposts where he will learn to work. His unit badly needs discipline and motivation. The United States of America has an obligation to instill these things and train young Private Beauchamp. I am certain that I read that somewhere. In Can the Air Force Contribute to Counterinsurgency, I reiterated some of the exchange that Major General Dunlap and I had concerning air power and counterinsurgency over a commentary at the Small Wars Journal Blog. I concurred with Dunlap’s opinions, and have encouraged the consideration of the increased use of air power in small wars in order to effect the kinetic part of counterinsurgency more rapidly and efficiently. Of course, on cue, the objection came that the increased involvement of air power would lead to greater collateral damage. In Air Power in Small Wars, I extended this discussion to include accounts that despite the tardy debates back home in the states, the Air Force was already finding a way to contribute to the counterinsurgency effort in Iraq. I also linked video showing anecdotal evidence of the hazards associated with the use of stand-off weapons such as artillery, pointing out that the objection to the use of the Air Force was equivalent to an objection to any stand-off weapon, whether Air Force or Marine and Army artillery. Even this discussion is a bit tardy. In A-10s Support Marines in Anbar, I discussed the fact that as of January 2007, the A-10 (438th Air Expeditionary Group) was going back into action to provide close air support for Marines in the Anbar Province. This relationship with the A-10s to assist with counterinsurgency might be about to become more formal (h/t SWJ). The USAF is considering a new A-10 COIN Squadron. Chief of Staff General Michael Moseley has told Jane’s he is considering the creation of a new counterinsurgency (COIN) squadron of A-10A Thunderbolt II aircraft for the Air Force Special Operations Command (AFSOC). 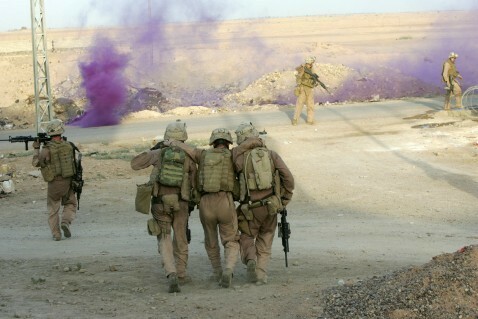 These pictures were taken during combat operations with the 2nd Battalion, 6th Marine Regiment, Golf Company, 3rd Platoon, fighting in Fallujah, and were available in the public domain via Yahoo. Yet, I have a personal connection to these photographs. This is just in from the New York Times. This optimism continued until the forcible rescue of two British special forces operators who had been arrested by the Iraqi police in Basra. But the proud British ROE may have been part of the problem. Not too long after this incident and due to the degradation in security in Basra, the British consulate was evacuated in January of 2006. British troop levels have dropped precipitously through Operation Iraq Freedom, from around 45,000 in March and April of 2003, to less than 20,000 by May of 2003, and then to around 7000 by the end of 2006. The British announced another pullback from Basra in February of 2007, conveying their intent to reduce forces to approximately 5,500 by the end of the summer. The pullback was not announced in a vacuum. The situation in Basra was calamitous as reported by NPR. “The problem is, in most of these four provinces, the British essentially gave up,” says Anthony Cordesman of the Center for Strategic and International Studies. Cordesman says U.K. forces lost control of two key provinces — Basra and Maisan — after elections in early 2005 and 2006 that brought a Shiite majority to power. “Once they came under control, the Shiites firmly were in charge of virtually the entire area and there was little the British could do about it,” Cordesman says. We must disagree with part of this assessment (” … little the British could do about it,” and ” … there’s nothing to stop them”). The U.S. forces are responsible for Anbar, home of the Sunnis deposed from power in the invasion. The British, while left with fewer troops with which to work, were responsible for control of the area in which the new power lived – the Shi’a, saved from the tyranny of the previous regime. In a clearer statement concerning the British effort and its affects, Anthony Cordesman of The Center for Strategic and International Studies, in a study entitled The British Defeat in the South, speaks openly about the situation in Basra. The British announcement of force cuts in Southern Iraq reflects a set of realities on the ground that has dominated southeastern Iraq for more than two years. Southeastern Iraq has long been under the de facto control of SCIRI and Sadr factions. The British effectively lost any opportunity to shape a secular and nationalist Basra in the summer of 2003, and the US defeat of the Sadr militia in March and April 2004 never extended to the southeast and Basra area. The British won some tactical clashes in Maysan and Basra in May-November 2004, but Operation Telic’s tactical victories over the Sadrists did not stop Islamists from taking steadily more local political power and controlling security at the neighborhood level when British troops were not present. The redefinition of objectives will likely involve focus on force protection, as British fatalities per unit has increased above U.S. fatalities per unit. For the first time since the war began, British soldiers are being killed in Iraq at a proportionally greater rate than U.S. soldiers, it was reported. The Royal Statistical Society analyzed death rates for the two armies between Feb. 5 and June 24, reported The Sunday Telegraph. During that time, Britain lost 23 of its 5,500 soldiers, while the United States lost 463 of its 165,000 soldiers, the newspaper reported. Increased violence in the southern city of Basra, where most of the British troops are serving, was responsible for the proportional increase in deaths, said Society spokeswoman Sheila Bird. The findings have led to more calls for the British government to withdraw its troops from Iraq, the newspaper reported. British military and political leaders have come to regard the war in Iraq as a “lost cause,” a senior British army commander told the British newspaper. By May of 2007 the violence had reached a fevered pitch, with rival Shi’a gangs fighting for control of the oil-rich city. Basra, the richest city in Iraq and gateway to the Gulf, could erupt into all-out war between rival Shia groups seeking control of its vast oil wealth as British forces prepare to draw down. The power struggle between factions of the Shia majority that has dominated Iraqi politics since the first post-war general elections in 2005 threatens to affect oil exports accounting for virtually all of Iraq’s income. In the latest development of a turf war that has all the ingredients of a gangster movie set in 1920s Chicago, rivals of the provincial governor fell one vote short of voting him out of office last month but have pledged to keep up the standoff. Basra, Iraq’s second largest city, is more or less free of the car bombs and the violence between Shias and Sunni Arabs raging in central Iraq, but it has descended into a chaos of its own. Sporadic militia battles, endemic corruption and death threats now scar the once tranquil port.